Ari Atoll, also called Alifu Atoll, is one of the natural atolls of the Maldives. Located in the west of the archipelago, it is one of the biggest atolls and spreads the islands over an area of about 89 by 3 kilometers in a rectangular alignment. 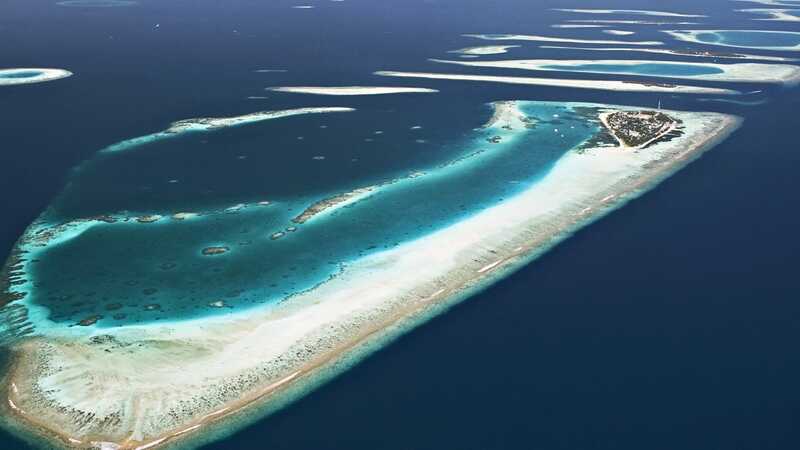 Ari Atoll has been divided into two sections for administrative purposes, namely Northern Ari Atoll and Southern Ari Atoll, Alifu Dhaalu Atoll and consists of 105 islands. 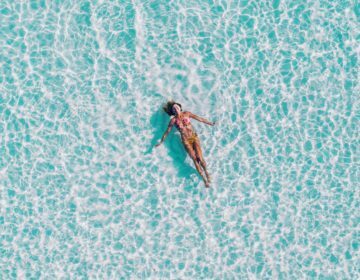 Southern Ari Atoll or Alifu Dhaalu Atoll lies south of the line between the channels of Himendhoo Dhekunukandu and Genburugau Kandu and includes resort islands, airport islands and industrial islands, with more than 20 islands designated for tourist resorts. Bodukaashihuraa means big coconut island and is an uninhabited island on the eastern rim of the atoll. Dhiggiri is a small uninhabited island with a long reef. Omadhoo is an ancient inhabited island with fishing being the primary occupation of the Islanders. Kunburudhoo is an uninhabited island with a long reef on the western side. Kuruburu is a type of creeper that grows on the island. Mahibadhoo is the capital of South Ari Atoll. It has an atoll office and a fish processing center and cold storage. Huvahendhoo opened as Lily Beach Resort in 1994 and features a house reef bordering the island that is ideal for snorkeling and diving. Vilamendhoo opened as a resort in 1994. It is a larger, more heavily timbered island and used to be a regular stopover island for fishing boats where they obtained fresh water. The north and south side of the island are a short step away from deep water and a healthy coral reef. Viligilivaru is a small island that opened as Ranveli Beach Resort in 1991. The island is situated on a narrow two-kilometer-long reef. In the past, safari dhonis used to pull into the beach on the north side of this island, attracted by the excellent diving and snorkeling. Dhangethi is an uninhabited island clearly distinguished from others by a large Nika or Banyan tree in the middle, which can be seen from afar. Nobody knows how old the tree is – some say it’s more than 200 years old – and its roots, spread over a large area, seem to confirm this. The primary occupation of the islanders is fishing, but work at nearby resorts has increased in previous years. Maafushivaru opened as a Twin Island resort in 1991. Dhenhasanu Lonu Bui Huraa has very little vegetation. The name is believed to have come from two men (named Hussan) drinking salt water on the island. Machchafushi opened as Machchafushi Resort in 1992 and is now called Centara Grand Island Resort & Spa. Vakarufalhi opened as a resort in 1994. Vakaru is part of a coconut tree. Kudarah started as a resort in 1991. Dhigurah lies on the south-east rim of the atoll. Dhigurah means long island, and at three kilometers, it is indeed the longest island in the atoll. It is also one of the most picturesque with its long beach, protected lagoon and thatched huts mingling with heavy foliage down to the water’s edge. The lagoon also offers good anchorage to safari boats during the north-east monsoon. The island is continually growing or being washed away. There are sandbanks at the southern end. Dhidhdhoo Finolhu started as Ari Beach Hotel in 1987 and was later renamed as White Sands Resort and is now called LUX* South Ari Atoll. 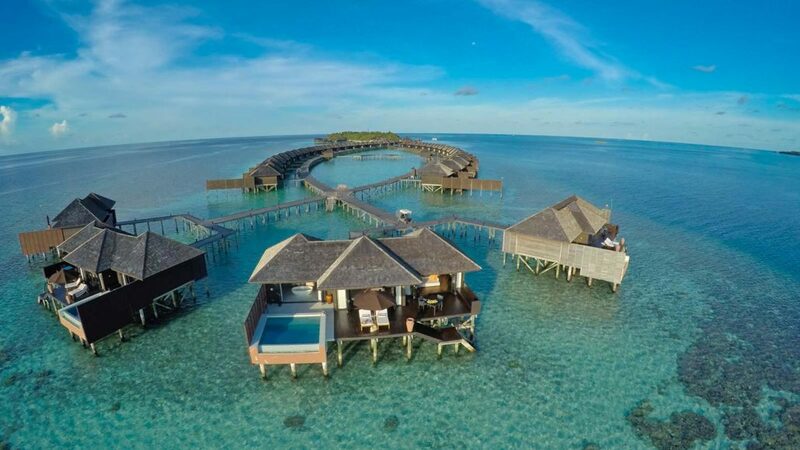 It was the first resort in the south of Ari Atoll and at the time, one of the most isolated resorts in the Maldives. Other resorts were soon developed in the area, and nowadays, the number of bungalows has increased, and the island redeveloped. Dhidhdhoo islanders have a reputation as being robust and fair-skinned people. Legend has it that in the past a French vessel was wrecked on the reef of this island and the from the sailors who stayed on, new blood was introduced to the island. Kudadhoo is a small uninhabited island near the edge of the reef next to Dhidhdhoo. Hiyafushi is another uninhabited island. Hiya means 69, so perhaps this island was the 69th island to be counted in the atoll. Ariyadhoo is an uninhabited island at the very south of Ari Atoll. 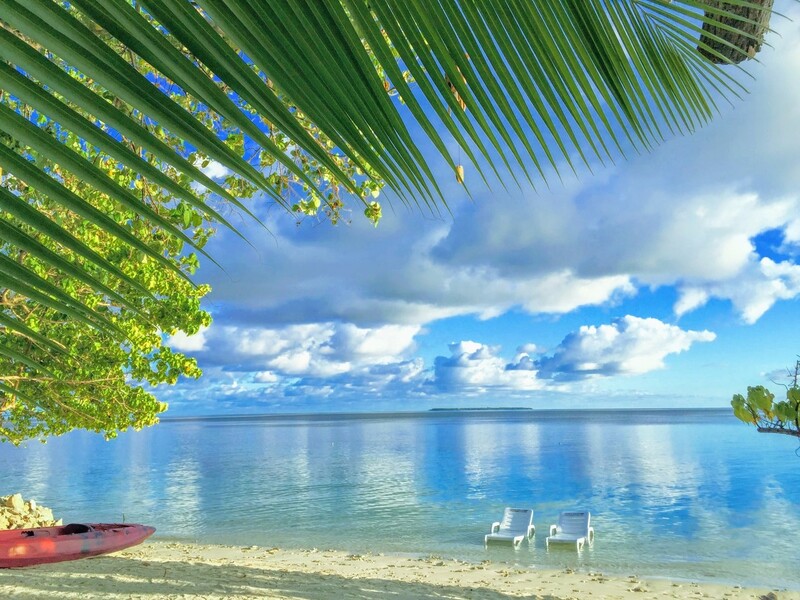 It is privately leased as an agricultural island with fruit trees and coconut trees planted in neat rows. It was once an island of importance, and Ari Atoll is derived from the name of this island. In 1959, sites on the island were excavated, and part of an old Buddhist monastery was uncovered. Various artifacts were found including a phallus measuring 38cm in length and 30cm in circumference at the base. Further excavations on two Havittas in 1998 revealed both Hindu and Buddhist relics. 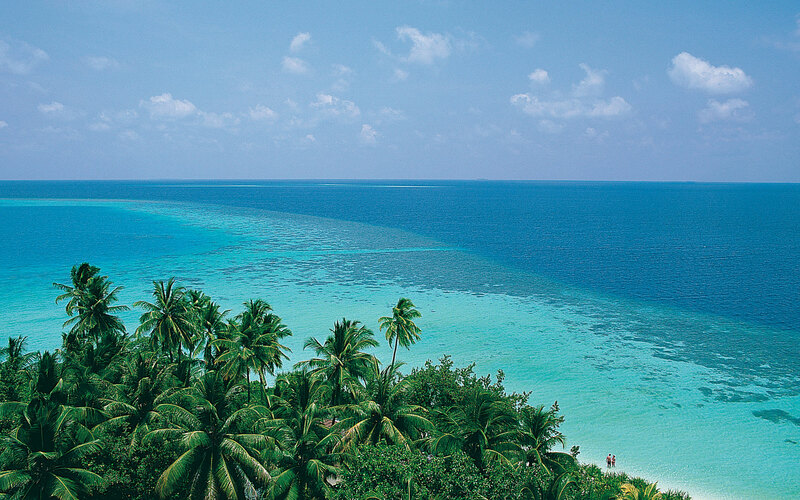 Maamigli lies on the 15 kilometer-long Fenfushi Faru, which is the longest reef in the atoll. Islanders are well-known for making limestone for building blocks and coral and sand mining. There is an old mosque on the island built at the end of the 17th century. A new harbor and airport are being constructed, and they are expected to service the south of Ari Atoll. Dhiffushi opened as a Holiday Island Resort in 1994. Nalaguraidhoo is a large island that opened as Sun Island resort in 1996. Nala means pretty, and guraa means a parrot. Nalaguraidhoo is an island where shear-water birds dig their burrows. Tholhufushi is a small uninhabited island. Fenfushi means ‘good water island.’ It is an old uninhabited island, and the islanders are well known for their coral carvings and tombstones and for building mosques from stone. The Fenfushi Friday Mosque is the same design as Malé’s Friday Mosque and is a fine example of the craftsmanship. It was built during the reign of Sultan Mohammed Ibn Al-Haj Ali (1692 – 1701 AD). Restoration of the mosque is now being carried out. Sadly, the artists are old, and few continue the carving tradition. Tombstones are now mostly made with cement and stone carving is a dying art. Several sandbars have formed alongside Fenfushi and one day they may form another island. Huruelhi is a small uninhabited island with low vegetation and lies on the north side of Heygahathu Kandu. Hukurudhoo is an uninhabited island with lush vegetation. It was once an inhabited island named Hukuruelhi. On the south-west side of the island is a giant pile of rocks. Hukuru means Friday and islanders tell a story of how the pile of rocks originated and the island became uninhabited. It is said that one Friday when the fishing season was outstanding, the Islanders went fishing instead of going to prayers, which invoked the fury of Allah. A whale was seen following the boats out to sea, and when the fishermen failed to return, the remaining islanders built a tower of rocks from where they could look out for the lost boats. After the fishermen disappeared, the remaining people moved to another island. It is possible the rocks built up as a result of a cyclone, as the long reef extends to the south-west in the direction from which a cyclone would blow. Sperm whales are occasionally sighted in deeper waters in the Maldives. They hold a special place in Maldivian folklore, and Maldivians call them Odi Kaan Bodu Mas, or ‘boat eating big fish.’ Early Arab mariners used to fire arrows at Al-baba as encounters with boats were not uncommon. Smaller whales were hunted then boiled in cooking pots to obtain oil, which was used for stopping up the seams of boats after they were sewn together. 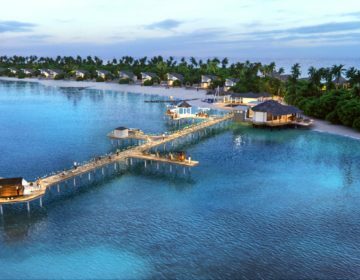 Rangali Finolhu first opened as Rangali Island Resort in 1992, then as the Maldives Hilton in 1997. Ran means gold and gaa is coral stone. The name may have originated from the bright colored coral stones glittering in the sun on the reef. 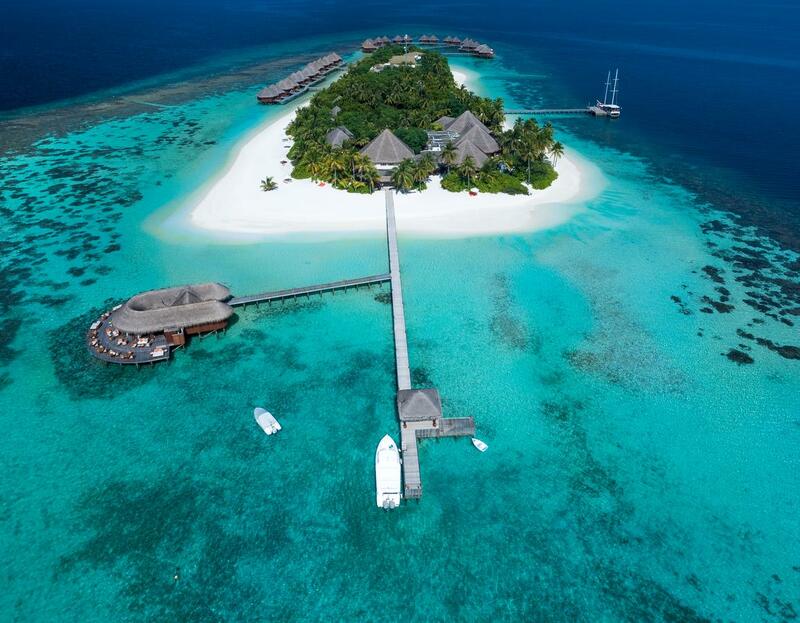 Rangali is an island on the outside of the same reef, and both islands are now called Conrad Maldives. Mirihi lies 6.5kilometers east of Rangali resort. It opened as Mirihi Marina in 1989. 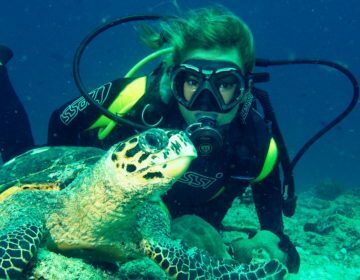 The south side of the island borders the edge of the reef and offers excellent snorkeling. Mirihi is a bushy creeper with small yellow flowers (Wedelia calendulacea biflora) and is often used in local medicine. It is potent medicine, and a measure of its strength is its reputation for driving away snakes. It is said that if an island has Mirihi bushes, then there will be no snakes on that island. There is only one variety of snake found in the Maldives. It is a 60cm poisonous one called nannugathi, and if it is beaten with a branch of Mirihi then, it is said, the snake will die. 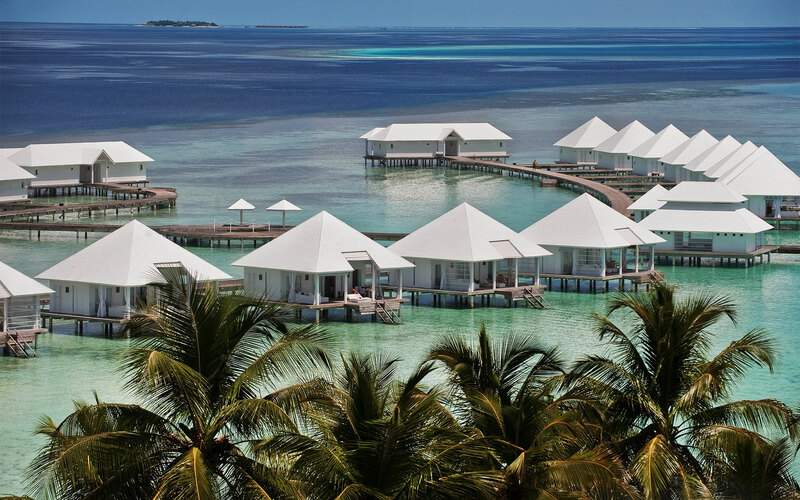 Angaagau lies in the middle of the atoll and opened as Angaaga Island Resort in 1989. Hurasdhoo is an uninhabited island called Pineapple Island by nearby resorts. The island is more fertile than many others, and at one time someone started growing pineapples there. They now grow wildly and the sweet smell if ripened pineapples attract many crabs, as well as tourists, to the island. The island is easily recognized by a single coconut tree in the center. Picnics and snorkeling are regularly made here as there is good access to the beach. Hurasdhoo is one island where frigate birds come to rest. Mandhoo is a larger inhabited island with big trees and lush vegetation. It is very fertile, and vegetables are grown here. The Islanders are excellent fishermen. Mandhoo has been inhabited for many centuries, and Buddhist relics have been found on the island. Bulhaa Lhohi is uninhabited and lies four kilometers northeast of Mandhoo. It has a few coconut trees and bushes, but a good sandy beach with access to the island and good anchorage. Picnics are popular here, and there are excellent snorkeling and diving on the south-west side of the island. Bulhaa means cat, but there are no cats to be seen on this island. Rahddhdiggaa is a small, uninhabited, low vegetation island 4.5 kilometers to the northeast of Bulhaa Lhohi. It has a good anchorage inside the lagoon and a sand entrance to the beach. Thundufushi opened as a resort in 1990. Thundu means the edge or point, and this island lays on the eastern point of Thundufushi Falhu. There is excellent snorkeling on the house reef and besides the long jetty. The island is now named Diamonds Thundufushi. Innafushi is uninhabited with low vegetation. Eboodhoo is another uninhabited island three kilometers northeast of Innafushi. It has a good cover of trees, nice beach and excellent snorkeling and diving, especially on the south side. It is often visited by day-trippers, and the island has a long jetty. Emboo is a small, wild fruit that grows on bushes (Glochidion littorale). Heenfaru lies eight kilometers to the east of Eboodhoo and is a small sandbank island with no trees and little scrub. On the outside of the reef is a big reef Maavaru Falhu, which has no island, but offers good anchorage in all seasons. Moofushi opened as a resort in 1990. The island is now named Constance Moofushi. Moo is the root of a tree. Athurugaa lies nine kilometers east of Moofushi. 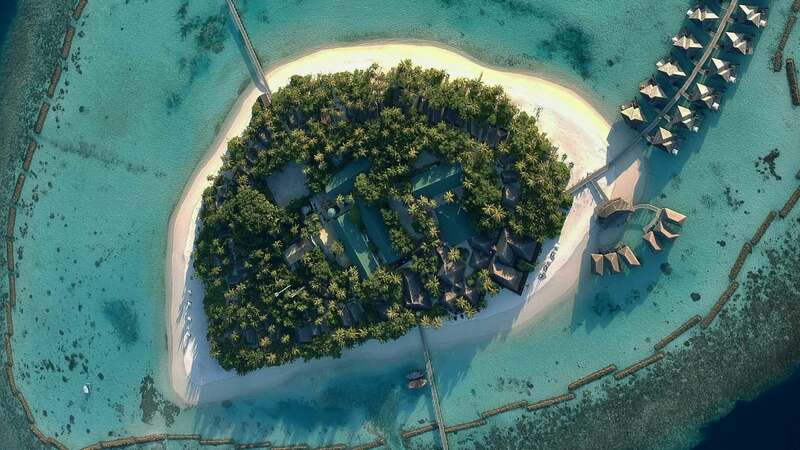 It started as Athurugau Island Resort in 1990. 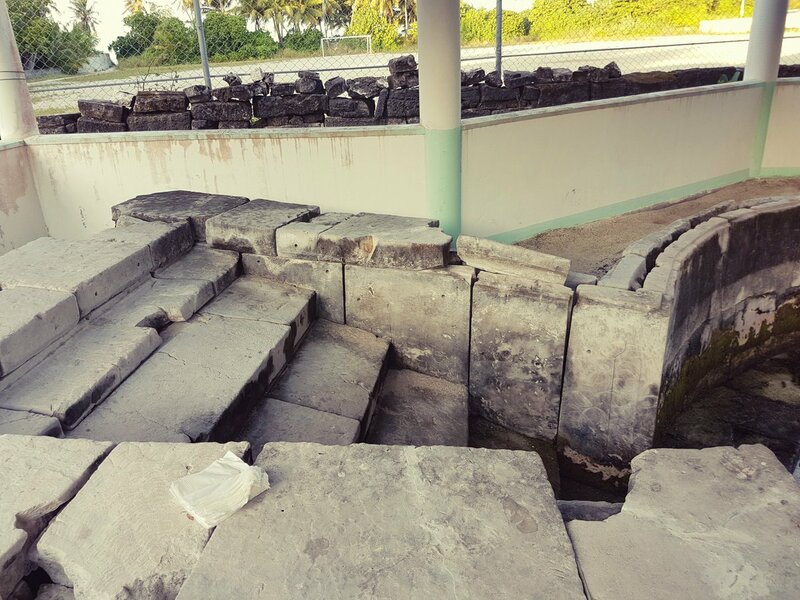 Athurugaa means stones without an arrangement. It has a good snorkeling reef on the south-east side of the island. The island is now named Diamonds Athuruga.